River Destiny Lodge - Norvalspont Accommodation. River Destiny Lodge accommodation in South Africa, Colesberg is situated along the banks of the exquisite Orange River on the borders of the Northern Cape, Eastern Cape and Free State. 34km from Colesberg and 15km from Gariepdam on the R58, River Destiny Lodge is in close proximity to the N1. Ideal half way stop to travel in South Africa from Johannesburg to the Cape or Eastern Cape. Book a bed and you will be greeted by friendly staff and experience the comforts of true karoo hospitality which will reinforce the good vibes that abound. River Destiny Lodge is the ideal conference or team-building venue. The lodge has its own private restaurant that serves breakfast, light meals during the day and has an a-la-carte menu in the evenings. Our kiosk will take care of basic necessities. By all accounts, River Destiny Lodge will make a great venue for a family getaway and a single traveler in need of a good nights rest. For the adventurous guests,canoeing, fly fishing for guests with patience and there is the spectacular Gariep Dam wall which is an absolute must see. Norvalspont Concentration Camp is an interesting part of history, located seven kilometers from the lodge and there are many Anglo Boer War sites in Colesberg. Some of the main attractions at River Destiny Lodge are the refreshing swimming pool, fishing along the Orange River, game viewing, while the jungle gym add up much fun and pleasure. The children will love the pool table, table tennis, dart board or challenge their friends or parents at volley ball in the swimming pool. The popular 20 luxury en-suite bedrooms or self-catering chalets all have a spectacular view of the Orange River. Each bedroom is equipped with a fridge, kettle, coffee, tea, sugar, milk, and ceiling fan. Bring your tent or caravan and discover the serenity of the Orange River while camping with the convenience of electricity outlets and spotlessly clean ablution facilities. River Destiny Lodge is the ideal conference- or team building venue. Groups of up to 70 delegates can be accommodated. Take the first turn off into Colesberg, travel through Colesberg and remain driving north on the R58 for 34kms. The R58 runs parallel to the N1. The turn off to River Destiny Lodge is on the left hand side of the road. 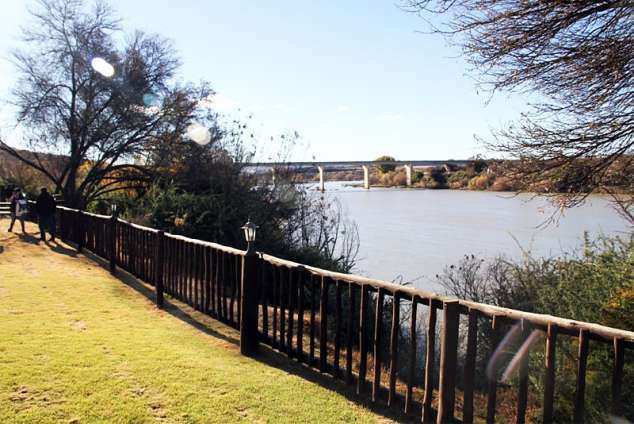 River Destiny Lodge is on the banks of the exquisite Orange River. River Destiny Lodge is located between Gariep Dam and Colesberg. Take the off ramp to Gariep Dam from the N1. Drive past the Gariep Dam town turnoff for approximately 1km. Turn right at the road marked R701 NORVALSPONT/R58 COLESBERG. Cross the steel bridge over the Orange River. Drive through Norvalspont, turn right at the T-junction towards Colesberg R58. Drive for 3.5km until you reach River Destiny Lodge turnoff on your right hand side. River Destiny Lodge is on the banks of the exquisite Orange River. We are 34km on the R58 from Colesberg and 14km from Gariepdam on the R58 which runs next to N1. From Capetowm you drive straight through the town of Colesberg on to the R58 next to the N1 to Gariepdam. From Bloemfontein take the Gariepdam turnoff from the N1 to the R58 Colesberg. 44214 page views since 18 Nov, 2004.